Making Sense of the "12 Days of Christmas"
Karla B. asks: Why is there twelve days of Christmas in that song? Does anyone really celebrate Christmas for twelve days? Even the most ardent fans of Christmas will agree – the song “The Twelve Days of Christmas” does not make a whole lot of sense. What is a partridge doing in a pear tree? Partridges are ground-nesting birds! 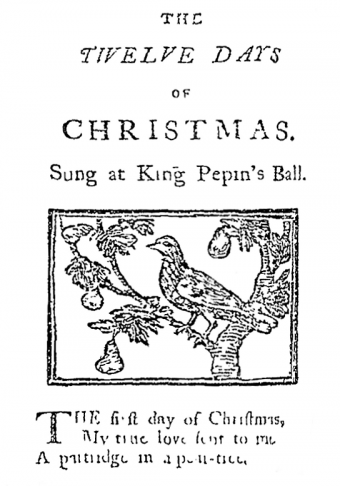 So where did perhaps the most earworm inducing Christmas song in history come from, and why are there twelve days in it, instead of just one? To begin with, while most people today only celebrate one day of Christmas, the holiday actually is supposed to encompass twelve days for many religious groups. While the exact days differ depending on the sect of Christianity, for most, the holiday begins on December 25th (Jesus’s birth) and ends on January 6th, which is known as the “Epiphany.” In between there are three feasts to celebrate the birth of Jesus and the “Incarnation,” as in the embodiment of God in human flesh. Hence, the “12 days” of Christmas part of the song. Now to the origin of the song itself: For this, we’re going to start by dispelling the amazingly popular myth that is touted by many an otherwise reputable source, despite a complete lack of evidence supporting the notion. To wit, many believe The 12 Days of Christmas is a Catholic catechism- as in it was written to help teach Christian values and a better understanding of religious tenants. As to why the lyrics are coded, the hypothesis goes that it was written at a time when Catholics were legally barred from practicing many aspects of their religion in Britain and Ireland via Penal Laws. So, each seemingly bizarre gift in the song is supposed to be a code for a particular symbol in the Catholic faith. Much like the idea that the candy cane was invented to symbolize Jesus, his purity, and his blood shed on the cross being complete fiction (see: The Truth About the Origin of the Candy Cane), the 12 Days of Christmas lyrics don’t appear to have any such religious symbolism, though of course there’s nothing wrong with creating such symbolism around existing traditions. But the subject of this article is the actual origin of the song, so you’ll forgive us if we have to dispel the widely touted symbolic origin story. Over the years since this was written, in about 1982, and first put out for the online world to enjoy, I have been deluged every year with hundreds of “you can’t prove this!” kinds of letters. Obviously, I cannot prove *anything* to anyone who doesn’t care to believe. I found this information while I was researching for an entirely unrelated project which required me to go to the Latin texts of the sources pertinent to my research. Among those primary documents there were letters from Irish priests, mostly Jesuits, writing back to the motherhouse at Douai-Rheims, in France, mentioning this purely as an aside, and not at all as part of the main content of the letters. In those days, even though there are those who will deny this, too, it was a sufficient crime between 1538 and nearly 1700 just to BE a Jesuit in England to find oneself hanged, drawn and quartered if he fell into the hands of the authorities… Whether you believe it or not is irrelevant to me. You can enjoy it or not, as you choose. I hadn’t written it as a doctoral thesis, simply as some delicious tidbit I thought the world would be delighted to share over a holiday season. It seems, however, that there is more than one grinch, and I am not at all interested in feeding the others who remain past the one in the Christmas cartoons. Believe if you will. Dissent if you choose. Let the rest enjoy the story. And, indeed, it turns out, despite extensive research done on the origins of this song to find such a connection, there has never been any documented evidence whatsoever linking it to such religious symbolism. Beyond the lack of evidence, this hypothesis strains credibility on a number of points. First, nothing in any of that stated symbolism would have been anything the Catholics couldn’t have sung or talked about directly under the aforementioned Penal Laws, as the stated symbolism doesn’t touch on anything uniquely Catholic- it’s all stuff the Church of England and most other Christian denominations have as part of their core doctrine. So members of those churches would have been more than happy to sing a song about such things directly. Others try to get around this point by purporting that it wasn’t a song for Catholics, but written for all Christians who couldn’t practice their faith openly. 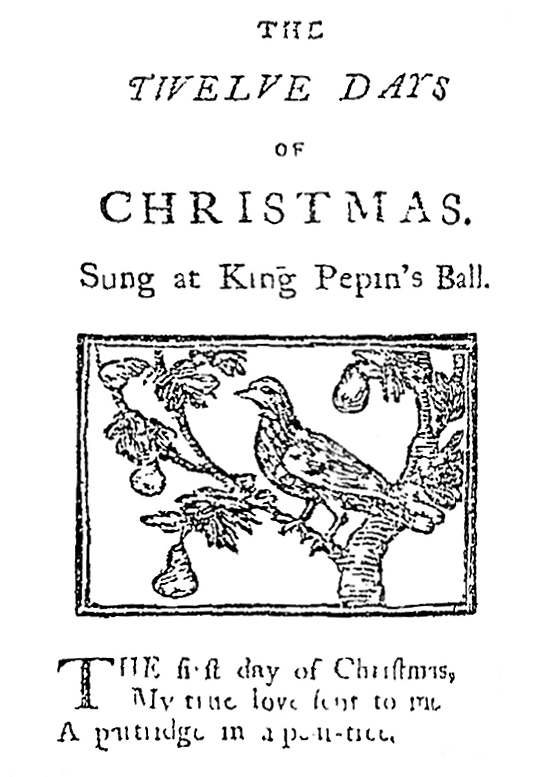 However, the song is literally titled the The 12 Days of Christmas and contains mention of Christmas in the lyrics as a core element of the song going back to the earliest known version… Perhaps not the best choice if one wanted to avoid letting on your celebration and lyrics have some connection to Christianity. And, of course, finding somewhere in the Western world around the time the song was written where all sects of Christianity were harshly banned is something of an effort in futility. On top of that, connections between the lyrics and the supposed symbols they represent are absurdly tenuous in most cases, meaning if this song was really meant to teach children Catholic precepts, as is so often stated, they must have had a lot of confused kids on their hands, requiring a lot of explaining to get the message across, with little hope said urchins remember what was said the next year when it was time to sing the song again. In that sense, the song would much better serve to teach the children how to count to twelve than teach religious canon. So what does the actual hard documented evidence say about where the song The 12 Days of Christmas came from? While there are various ways in which these sorts of memory-forfeit games could be played, Phinney also notes that in such children’s games, the singers would often split into sides of boys and girls with each trading verses. When someone got out, they had to kiss someone on the opposite side or were otherwise made to pay a trifle penalty. Fast-forward to today and there are literally hundreds of modern versions of “12 Days of Christmas”- some more Muppet-y than others- to go along with the countless variations sung historically. While the original versions weren’t meant to have religious symbolism embedded in them, they were at least meant to be fun; so no matter if you are partial to Donny Osmond or you really love the Rugrats remix, perhaps we can all agree that we should definitely re-establish the practice of giving a kiss when you forget a lyric of the song. I love this website, that is all.